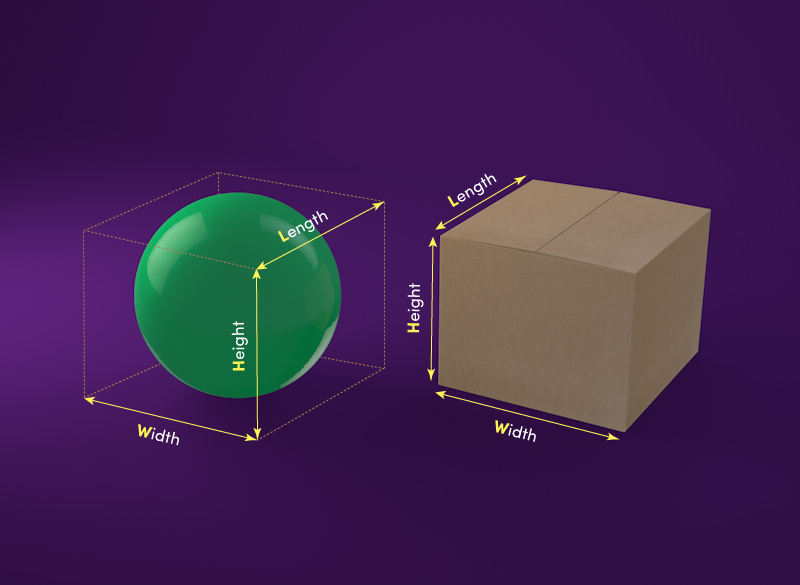 Volumetric weight is used in the courier and logistics industry to calculate how much space an item is going to take up in the courier's network and how much weight that would physically represent. Quite simply, if your item is light in weight but large in size and therefore takes up a load of room in the courier's van's and aircraft when being moved about, the cost charged will reflect this. height x length x width in CM divided by for example 5000. Using the above as a guide, if your item was 60x20x30cm and weighed 5kg then it's volumetric weight would be 7.2kg and this is what your quote would represent. The division figures are different across various different couriers but in general somewhere between 4000 and 6000 is used. The courier will compare the volumetric weight to the actual physical weight of a parcel and charge whichever is the greater of the two. This is known as the invoiced/chargeable weight. Don't worry, we work the volumetric weight out for you. To take the stress out of this for our customers, we have incorporated all of these factors into our easy and simple to use quote engine. When you book with Parcel Monkey, as long as you provide the accurate dimensions of your parcel into our quote engine, along with the correct parcel weight and delivery destinations, you can be sure of an accurate quote. This makes life so much easier for you when it comes to booking with us. When you perform a quote, this will be calculated for you. Why is volumetric weight important? Parcel Monkey will get charged on the volumetric weight of your item so it's very important to be sure that your measurements and weights are accurate when you book. Otherwise, this can cause an issue later down the line and you may be additionally charged based on the findings of the courier themselves. Therefore package your parcel well and then once it is all prepped and ready to ship, weigh and measure it correctly in order to then get the correct price. We work closely with the couriers we work with an aim to provide you with all the relevant information you may need when shipping a parcel both UK wide and internationally. Parcelforce have this handy guide to review should you have any more questions about volumetric weight. DHL offers a calculator should you be using their services for an overseas shipment, but our quote engine will be working out the correct information for each carrier when you get a price with us. Why have I been additionally charged for an oversized item when the weight was found to be just 10kg? Parcelforce surcharge heavily for items that exceed 30kg in either physical or volumetric weight. This point is made clear to all customers during the booking process via a tick box which must be acknowledged before proceeding to payment. When Parcelmonkey Ltd are invoiced by Parcelforce, all items that they find to be outside of their terms and conditions are given a default weight of 10kg but charged for at the surcharge amount. Our system will notify our customers of the additional charge based on the weight stated by Parcelforce, which as mentioned will be 10kg and can, therefore, cause confusion if the weight declared at the time of booking was higher. We understand this and should our customers require the exact weight and dimensions recorded by Parcelforce then we are more than happy to request these directly from the courier.